Delcam Sales Partner Artisan CNC will demonstrate how ArtCAM JewelSmith artistic CADCAM software allows jewellers, pewter-smiths, silversmiths and goldsmiths to create highly-crafted personalized or custom pieces or new complete lines with ease on booth 1879 at the JA New York Winter Show to be held from February 28th to March 2nd. Jewellery can be created directly in the software or, if master modelmakers prefer, they can first either hand-draw their designs, hand sculpt a 3D model, or create the piece in alternative drawing software. Their work can then be simply scanned or imported directly into ArtCAM JewelSmith. Using ArtCAM JewelSmith’s unique relief layering system, the user can build their design using a number of layers, in a similar fashion to PhotoShop, which can then be edited at any point during the design process. These layers can be worked on individually, so allowing the user to undertake detailed editing without having to update the whole model. For band rings, the jeweller also has the option to design on an unwrapped layout of their ring. They can then switch between an unwrapped and ring view at any time to check the design as the project progresses. Once complete, the jewellery model can be saved as a rotatable 3D PDF file, which can then be e-mailed to the customer for approval. Once authorized, the designer can then select one of ArtCAM’s powerful machining strategies to calculate the toolpaths required for manufacture. In the 2010 release, a great deal of technology, including the latest multi-threading capability, from Delcam’s industry-leading CAM system, PowerMILL, has been incorporated into ArtCAM JewelSmith to give even faster calculation times. 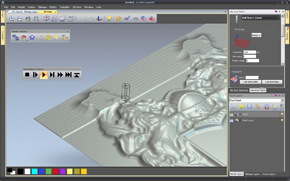 Before the toolpaths are sent to the machine, the artist can check the appearance of the resulting piece using ArtCAM’s new and improved toolpath simulation. This gives the designer the opportunity to alter their calculations prior to machining, saving both time and money. The JA New York jewellery show is the premier international jewellery event that brings exhibitors and retailers from around the world together in the glamorous backdrop of New York City. The JA New York shows dates back to 1906 when its predecessor, the American National Retail Jewelers of America (ANRJA) was founded. The legacy of the ANRJA show has been carried through JA New York, as it celebrates 103 years of excellence and service to the jewelry industry. The JA New York Shows are produced by the National Jeweler Network (NJN) a world-class trade show producer and publisher of the industry leading National Jeweler magazine. The JA New York Shows are also the only shows affiliated with Jewelers of America, the largest and most respected jewellery retailer association in the U.S.
JA New York offers two-day education program with insightful tips from industry experts. Randy Hayes of Artisan CNC will act as a panellist in the workshop "Identifying the CADCAM solutions that are right for your business” on Sunday February 28th from 2:00- 2:45pm. Stories abound of Jewellers investing thousands of dollars on products or systems that have gone under-used or even unused because they were given inadequate information prior their purchase. Attend this seminar and learn how you can avoid these costly mistakes and find out which CAD or CAM product is right for you.